Water is a vital resource that everyone needs in order to survive, water is also very heavy though which means that carrying a lot of it isn’t a viable option. If you’re going to be out hiking for a long time then getting the best backpacking water filter would be the perfect solution. This would allow you to drink healthy water wherever you are, without having to worry about carrying too much at once. 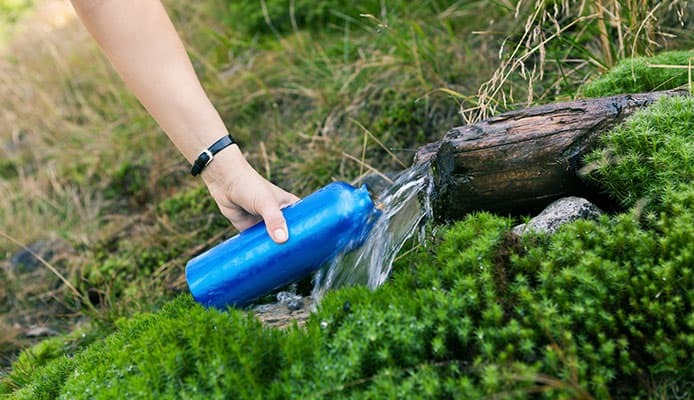 Choosing the best backpacking water purifier can be difficult though as there are many different types, as well as sizes, filters, containers and chemicals. That’s where we are here to help, as we will explain all the important features to ensure you are confident in knowing exactly what you are buying. Once you have finished reading this guide, you’ll know exactly what type of backpacking water filter you need. When it comes to backpacking water filter reviews, this is one of the best products on the market with many happy customers. The water filter system is very small as it will just fit onto the palm of your hand with a hollow membrane inline filter. It attaches to the drinking pouch that it comes with but it can also attach to standard water bottles too, as well as hydration packs, which means that you are able to choose the most convenient way for you to take in your water. It also has a straw which means that you would actually be able to drink it directly from the water source. It removes almost all bacteria including the common nasty ones such as salmonella and E.coli. The filter will be able to work for up to 100,000 gallons of water. 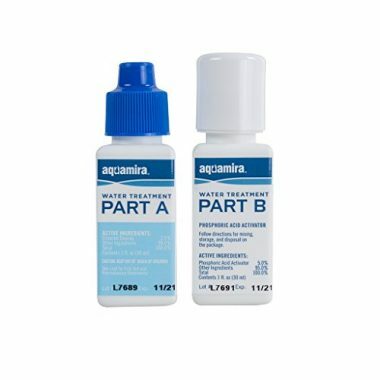 This is a top rated backpacking water purifier from Aquamira which is come in the form of two treatment bottles which are able to make safe up to 30 gallons of water. They are very small, making them very easy to carry. The liquid chlorine dioxide will be able to kill waterborne pathogens to leave you with safe drinking water. It performs better than iodine or chlorine bleach and it also doesn’t leave a bad aftertaste either which many other products can do. The small bottles work perfectly together in order to give you the peace of mind that you need and have a shelf life of four years, so will last for a very long time. They are perfect for emergencies but also work well as a general backpacking two. 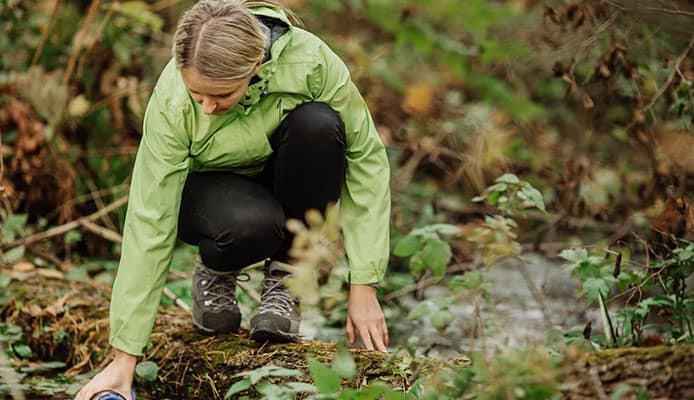 This is a brilliant hiking water filter which is another two-part system but this time it comes in the form of tablets which will be able to neutralize any harmful bacteria in the water and then will be able to clear it and get rid of any bad taste. They are very highly rated by those who have used them so you can be confident that they are going to be highly effective when it comes to giving you safe water. It’s effective in extreme types of water too in order to give you confidence in all conditions. The tablets are very portable and they will be able to easily fit into your backpack to be used at any time. They are very quick too and you can pop them in your bottle and in a matter of minutes you will be able to quench your thirst. If you’re looking for a camping water filter, then this product from LifeStraw would be ideal. It’s bigger than most other types of solution on this list but is able to purify a large amount of water in a short period of time. It will remove almost all viruses, bacteria and cysts in order to ensure that you stay healthy after drinking the water and is able to provide nearly 5,000 gallons of drinking water which is a very high capacity. It is a gravity filter which means that you are simply able to pour the water into the top of the filter and allow it to work its way to the bottom where you can then fill it up. It’s able to filter up to 12 liters of water per hour and will provide you with a lot of safe water. 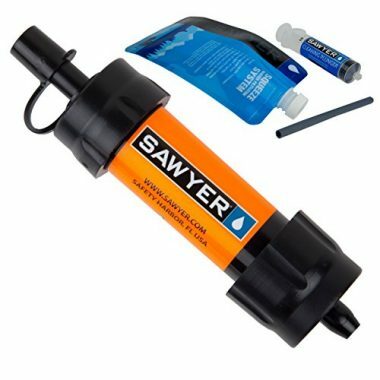 In terms of a water filtration backpacking product, this is a unique solution from Platypus which looks more like something you would find in a medical center. It is highly effective though and highly rated so you can have a high level of confidence in it. 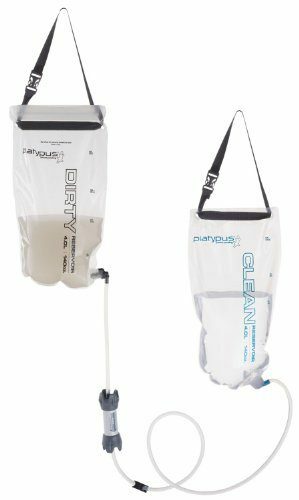 It works via gravity with a hollow fiber water filter system whereby you hang up your bag full of dirty water and then let it flow into your clean water bag. It meets all the guidelines and will kill all the harmful bacteria in the water. It will easily hang from any tree or branch and will work in 2.5 minutes to give you up to 4 liters of water. The filter cartridge is able to process 1,500 gallons of water at a rate of 1.75 liters a minute to give you a high volume of water very quickly. 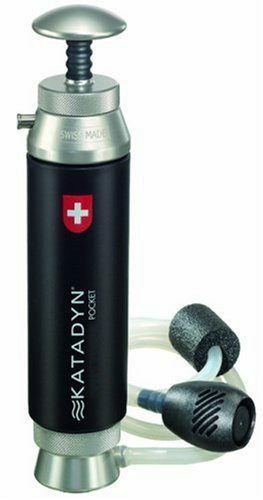 Katadyn have produced a brilliant portable water filter which comes in a compact size, making it very easy to carry. This is a pump action filter but one which doesn’t require a great deal of effort in order to get the water that you need. It’s very easy to use and is small enough to be stored away in a backpack and pulled out whenever you need it. It has a glass fiber filter which is able to produce a high output but without you having to strain yourself too much in the process. It contains activated carbon which is going to be able to improve the taste and reduce any chemicals too, leaving you with nice and refreshing water. It doesn’t need back flushing which makes is very low maintenance and easy to care for. 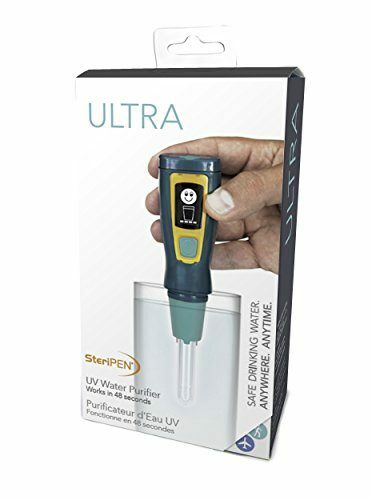 If you’re looking for the smallest water purification backpacking product then you don’t need to look any further than this SteriPen. It works via UV light which will be able to destroy any germs which are in the water and will be able to kill almost off bacteria and viruses. It requires a battery but will be able to deliver 50 treatments per charge, therefore it’s very unlikely it will run out on your trip but it is very easy to recharge when required. It is able to last up to 15,000 liters of water before it will stop being effective. It has an OLED display which will be able to show you key information on the treatment, lamp and battery status to keep you informed. It’s highly certified and a simple and effective way of getting clean water. 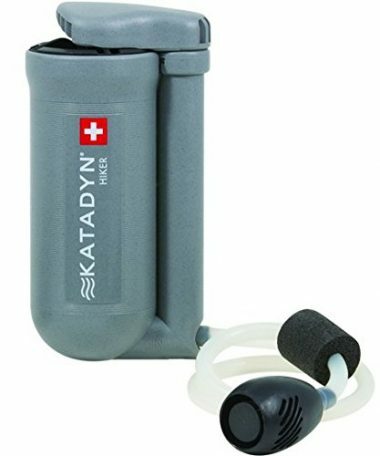 This is another brilliant product from Katadyn whereby you are able to easily use the pump in order to get fresh water. It features a ceramic filter which will be able to directly take the water from source and pump it into your chosen container. 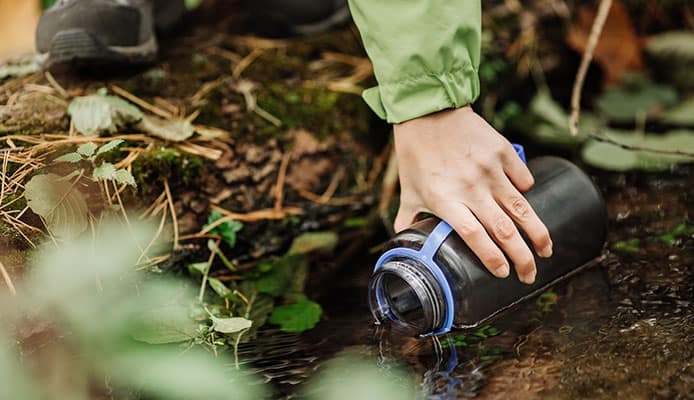 It features an active carbon purifying element which is going to be able to make the water taste like normal to ensure that you have a safe and refreshing drink when you are out there backpacking, hiking or in your camp. It is able to pump out one liter of water per minute which means you’ll very quickly have access to all the water that you will need to be able to carry on your trip. The filter is also easy to clean and can be done while you are backpacking. 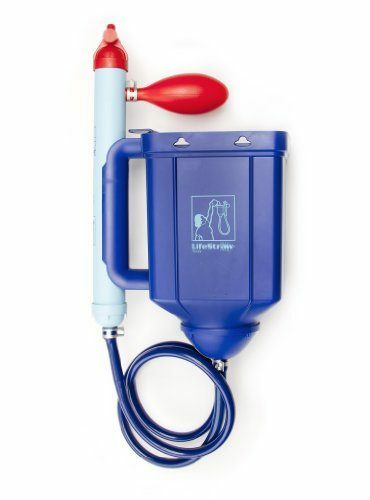 This is a product which has a different type of pump action which isn’t quite as compact as others but still highly effective at being able to deliver a high volume of clean water. It is 7.5 inches long so will still be able to easily fit into your backpack. It works via a replaceable carbon and ceramic filter which will be able to remove any bacteria as well as anything else in the water which might be dangerous. It works very well at pumping water into wide mouth water bottles and hydration bladders. It’s highly certified and will be able to give you 2,000 liters of water until the filter needs to be replaced which can be done very easily. It has a limited lifetime warranty which will give you peace of mind that you’re buying a quality product. This is a good looking model from GRAYL which will be able to squeeze the water in order to give you a fresh drink. It works by filling up the container and then pressing down to filter over it in order to activate it and take out all the debris and harmful bacteria. It comes in a water bottle shape so is able to be drunk straight out of it which makes it highly convenient and able to be stored in the water bottle mesh pockets that you find on all backpacks. It’s very vast and easy to use and doesn’t need any pumping or batteries. It will remove almost all the bacteria and viruses, and will also remove any sediment too. It’s perfect for emergency preparedness and camping but excels when backpacking. The size of your water filter is going to be important, as is every piece of equipment that you take with you when you are backpacking. You need to look at what items you plan on taking with you and how your water filter is going to fit in with that. If you are going to be hiking out from a more permanent camping solution that you will be returning to then you can most likely leave the filter at camp but most of the time you will be able to take it with you, and most of these filters are very compact in size. 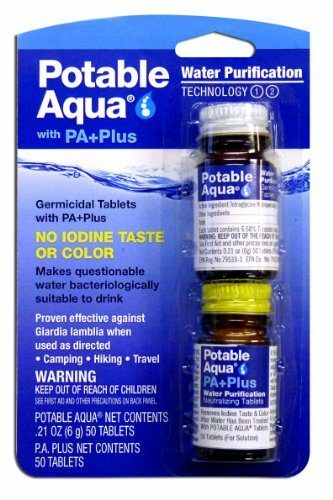 If you have very little space available in your backpack then it could be the best idea to use purification liquid or tablets. 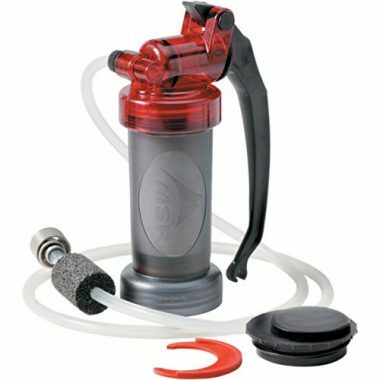 If you have a little bit more space available then you would be able to take a slightly larger model such as a pump. It all depends on how you usually travel. If you are traveling in a group then it’s likely that only one of you would need to carry a filter. It’s important to plan ahead and make sure that you’re not getting something which will be too big to carry. Just as size is important, weight is too and you want to be able to make sure that you’re not getting anything which is too heavy. If you are going to be ultralight backpacking then this becomes more of an issue as you will want to keep everything to a minimum. You not only have to worry about the weight of the product, but also the weight of the actual water you will be carrying too. 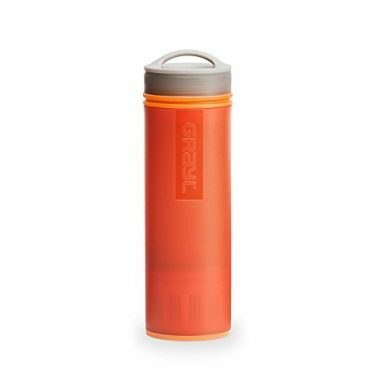 You might prefer to store it in order to keep it with you or simply drink at the source of the water and then hike without carrying any, or the bare minimum. You need to assess which type of water filter is going to best match what you plan on doing, carrying a few liters of water is going to be very tough. Some of these products aren’t instant, therefore you might have to carry water while they work. Therefore, if you want to backpack light then you need to check the weight of the product but also the water you will be carrying too, that way you know that you won’t have any problems or strain yourself too much by carrying extra weight. There are many different types of portable water filter out there so here we will go through the main types in order to explain the merits and disadvantages of each one. Straw – These filters work exactly like a drinking draw, sucking water directly from a source. Due to that they are very quick and efficient, and are also on the lower end of the price range too. It does mean, however, that water is only available when you are at the source and is only really useful for one person. It also involves getting down onto the ground and putting your face very close to the water, which might put some people off. Pump filter – With pump filters you are able to get the exact amount of water that you need so you won’t have to worry about getting too much or too little. The water can also be pulled from any available water source with the small tube and the cartridge is replaceable. It does require some manual pumping action which, while not exhausting, is quite laborious at times. The element will also most likely need to be cleaned in the field and while they can be quite compact, they do take up more space than other options. Gravity – Gravity works by simply letting the water drip down a filter which means very little effort is involved. This is a great option for groups as it is able to process a large quality of water. The cartridge will be replaceable, making it easy to use. You do though need somewhere to be able to hang it which can be laborious and it’s not the quickest way of getting water either. You would also need a significant body of water in order to fill it and it would also need to be cleaned too. UV light – UV light works by shining the destructive light waves in order to kill the bacteria. This is very easy to use and makes the water very drinkable and you would never have to clean or replace the product which makes it highly convenient. There is no pre-filter though which can be a nuisance when you have silty or cloudy water and it is only able to filter a small quantity of water at any one time. It also requires a recharge too but most are able to last for a long time on a single charge. Bottle filters – Bottle filters are another good solution where you simply fit the bottle full of water, and a filter in the cap makes it drinkable. This is very easy and quick as you will have instant drinking water and they are also quite a cheap option too. One problem is though, is that you are limited to the size of your bottle so unable to get a large quantity of filtered water. It also requires cleaning too and the element or cartridge will need to be replaced fairly often, depending on use. Squeeze filters – These filters work by attaching themselves onto a bottle or a pouch and working buy you squeezing the water through the filter. This is another easy and quick method and some are able to also be used by gravity or like a straw. It’s a very light and simple solution. Again though, you are limited by the size of the container that you have so it wouldn’t be suitable for anyone needing a large quantity of water. Cleaning is also required, as it is with many products. Chemicals – These are simply added to the water and then you wait for them to take effect. That makes them very easy to use and they are probably the lightest option and can easily be stored anywhere. They are a great emergency option too. It can take a long time for them to work though, which would be a minimum of 30 minutes. You also have to check what type of chemicals they are, as iodine can leave a bad taste, not kill all protozoa and isn’t suitable for anyone who is pregnant. It might also require the water to be pre-filtered. If your filter is mechanical, which is most types, then you are going to have to change the filter at a set period of water usage. This will either be a replacement product, as it is with larger devices, or something that you will have to throw away once it’s spent. You need to consider this when thinking about the overall cost of the product and how much it is going to be over the course of its life. You also have to think about convenience, as ideally you don’t want to be bringing spare filters and will want to make sure one lasts for a whole trip. With UV light filters, the battery will also run out but this is usually an internal rechargeable battery so would simply need to be recharged. You need to factor in future costs when it comes to your filter as they could be significant. The filter pore size refers to the size of the holes that the water will have to pass through in order to get to the drinking side. This is naturally an important consideration as it affects what is able to pass through the device and how much it is going to be able to block of the bits that you don’t want to come through. For non-mechanical filters, this doesn’t matter as your water won’t be passing through a filter as they will just be killing the bacteria inside of it. Your mechanical filter still needs to let the water through though and it can be a delicate balance to get the right size. This is measured in microns and you want this figure to be as small as possible. When it comes to what it gets rid of though, you just want to ensure that the filter is going to be able to get rid of everything that will be harmful to you, so you just need to check this before you buy one. If you have a mechanical filter then you’re not going to have to worry too much about pre-filtering the water, as the filter that is in the product is going to be able to do this for you. Once it cleans the silt and debris that is in the water, it can then get to work sterilizing the water. If you have a UV or chemical purifier though then you are going to have to deal with the water that is presented to you. If this is going to be taken from a clear stream, then this is not going to be much of a problem but from other sources it would be an issue. It could well be that you will want to be able to bring a pre-filter with you on your trip in order to clear out these contaminants. This is a major downside of having such a product but one which can be overcome quite easily with a pre-filter. When it comes to cleaning your water, the most important job is for your device to be able to remove bacteria and protozoa as they will be commonly found on the water in North America and any other developed countries, with bacteria the most likely to make you ill.
Bacteria is well-known for causing illness but protozoa are also dangerous as they are single-cell parasites. Some chemical treatments aren’t able to remove all the protozoa which is important to check, but all types that we have covered here are able to get rid of bacteria. Viruses on the other hand are harder to get rid of and most mechanical pumps won’t be able to get rid of this. In developed countries, this is not an issue as viruses in water are extremely rare. In poorer countries though, it’s best to be safe and UV light and chemical treatments can get rid of them all. UV lights (and high-tech filters) are the only product which can effectively kill all three. In dangerous areas, it could be a good idea to have a regular filter and a UV light too, as that would give you protection from everything with the capacity and pre-filter that a regular filter would have. It’s also important to consider what type of container that you are going to be taking on your trip. Some of these solutions work as their own container whereas other solutions will you require to filter the water into your own container. While it may sound like the easiest solution to have your own container, this does limit the amount of water that you are able to carry. The reason for this is that you would only be able to fill it up when you are close to a water source, whereas with larger containers, you can carry a lot more water. The importance of this depends on your own personal preference and also the type of trail that you are going on. If you’re always going to be close to water then you would be able to have a smaller container and just simply fill it up when required. Some of these solutions are very small such as the UV light, tablets and water treatment and have a very low weight. Some people don’t want to use them as a primary water treatment though as they are unable to filter out any sediment that may be in the water. They can work perfectly though as a backup when your initial system has failed and you still need to make your water safe. It can be a very good idea to take both options so that you are always covered if one fails. It could also be that you are going on what you hope to be a simple trail and think that all you need is the water bottle that you are carrying and don’t need a filter. These products can be perfect if you ever find yourself in trouble as they are so small that you can carry them all the time. Q: What Is A Water Purifier? A: A water purifier is something that will make the water pure (or close to) but does so without a filter. It will aim to kill the harmful elements which can be found in water but won’t be able to take out any sediment or debris which can be found in it. This makes it have a very low cost due to the fact that you won’t have to replace any filters but it does mean that you would have to find a relatively clean water source or a pre-filter in order to have an enjoyable drinking experience. Q: What Is A Water Filter? A: A water on the other hand doesn’t treat the water, instead it aims to take everything out of it which might be harmful. This sometimes doesn’t have the same level of protection as a water purifier but it will be able to take out the silk and sediment. That makes it nicer to drink than purifiers but it won’t get rid of viruses which can be important if you are in a poor country. A filter will simply filter out the water but are generally much bigger products than purifiers and need more maintenance. Q: What Is More Convenient To Choose A Water Purifier Or Water Filter? A: The answer to this depends on your own specific needs. Water purifiers tend to be a lot smaller than water filters which make them easy to carry around but they also don’t remove any sediment which could be a major inconvenience to many. Water filters on the other hand are able to produce clear water straight away as anything else is going to be filtered out. They do however need their filters replacing and are generally a lot bulkier, therefore the most convenient option is for yourself to decide. You might be wondering what type to buy but one thing is for certain and that’s the fact that if you are taking water from a natural source then you need to make sure that it is going to be treated in order to prevent yourself from getting ill. Getting rid of bacteria and protozoa is essential, as are viruses if you are in a developing country. There are many different types out there which all have their advantages and disadvantages. How you are going to be backpacking, for how long and the location all play a part in what would be the best solution for you. Due to this, you need to analyze your own situation and think about which features are most important and how much water you need. There are other important aspects to consider too such as the weight, replacement parts and the container that you will have to carry. All of these need to be factored in before you are able to find the perfect water filter for you. Once you do, then you would be able to head out on your backpacking trip knowing that you will never be without water which is safe to drink. You always want to make sure that you’re safe, and there’s nothing more important than drinking water. Hopefully this guide has given you all the information that you need in order to buy your backpacking water filter with confidence.